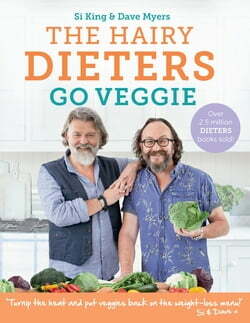 The bestselling, big-hearted and down-to-earth chefs, The Hairy Bikers, return with 80 delicious vegetarian recipes to make losing weight and eating less meat even easier.In their multi-million selling HAIRY DIETERS series, the Hairy Bikers proved that you can eat your favourite foods and still lose... read more weight. Jam-packed full of delicious, low-cal versions of traditional classics and family favourites, they have taken the deprivation out of dieting and helped millions shift the pounds.Following on from THE HAIRY DIETERS, THE HAIRY DIETERS EAT FOR LIFE, THE HAIRY DIETERS GOOD EATING and THE HAIRY DIETERS: FAST FOOD, THE HAIRY DIETERS GO VEGGIE, shows that going vegetarian can be just as easy as going low-cal. Whether you want to cut out meat entirely, cut down, or just incorporate some more meat-free dishes into your diet, the book is full of simple and easy-to-follow recipes for tasty veggie meals and snacks, from Lancashire Hot Pot to Veggie Sausages. Si King and Dave Myers, aka the Hairy Bikers, have been entertaining and feeding Britain with their unique blend of delicious recipes, cheeky humour and motorbike enthusiasm for years now. The Hairy Dieters books have sold over 3 million copies in the UK, and their fifth book is set to make healthy eating even easier. Si King and Dave Myers are the nation's favourite food heroes. The stars of numerous TV cookery series, they represent all that is good-hearted and loved about food.